The use of Swiss symbols and emblems are regulated by special laws. This you can research and find information about on the internet. Some “fake knives” can cause misunderstandings or cause trouble for the makers of real knives. It can deceive people that would like the genuine products. In some cases it can be a crime to make fake knives with Swiss symbols that are not real or made with authorization. In some cases the knives had been made for the Swiss souvenir markets and made with very low quality. 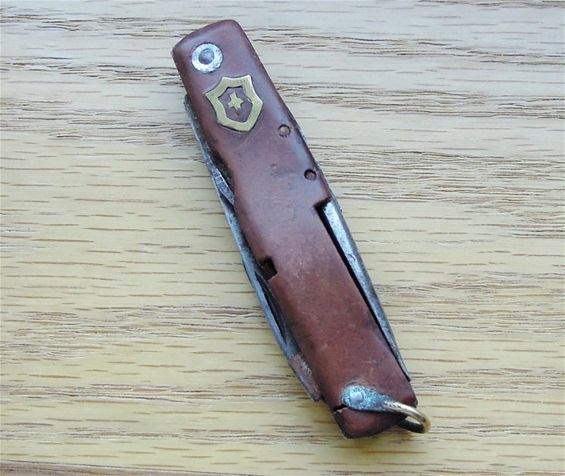 Victorinox made the Elinox or economy made knives for the Swiss souvenir trade because of the fake or low quality foreign knives. The knife on the picture above is old and beat up but it got an emblem that could cause a problem or in some cases deceive people. I have not found the origin or any special information on this knife yet. It does however show that it is not a modern problem with fakes. It`s been a problem all the time. The problems today is for me special because it much larger. It is also important to have in mind that the use of a crest or cross is not always only Swiss. Here is a knife that has been on the market and it is easy to distinguish this as just a SAK style knife. I do not feel this is a knife that is in any danger zone. It is also stamped Stainless China so it is no problem. Some would say it takes advantage of the real knives and functions. The quality on this knife is not good and the functionality is maybe just 30%. I believe this knife is some years old. Just a little add to your phantastic website: The knife on top of the page "battle fakes 2" is a pocket-knife from France, the manufacturer ist PRADEL.